Common Size: 10-18 inches and 1/2 - 4 pounds. Specimens in excess of 11 pounds have been caught in other parts of the United States. Food Habits: terrestrial and aquatic insects, crayfish, minnows and other soft rayed fish. 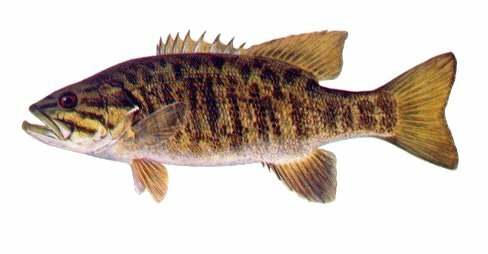 Spawning: smallmouth bass will begin their nesting activity when water temperatures reach 60° F. Nests are located in shallow areas of reservoirs or in protected areas of streams where the current is minimal. The typical nest will contain approximately 2,500 eggs, which are guarded by the male until they hatch in two or three days. The male also guards the newly hatched fry until they are dispersed in 12 to 16 days.